What does a label mean ? Mountain milk, a truly unimpeachable product ? Perhaps. European milk quotas will soon disappear and the label of geographic origin is a tool in the fight for market share between dairy farmers and chain stores. But it cannot guarantee the quality of a given milk which, quite often, does not even come from the « high pastures ». In an effort to attract English tourists during the Belle Époque, the « Nicean Alps » were invented, with a Swiss farm just two kilometres from the beaches and a typical chalet for milking the cows. A touch of the Alps by the sea, where the milk in fact played an important role. You have to ad-ver-tise ! The little Swiss shepherdess is an idyllic character capable of projecting the right image for dairy producers. Heidi is a magical name that evokes flower-studded pastures where children and goats can romp. 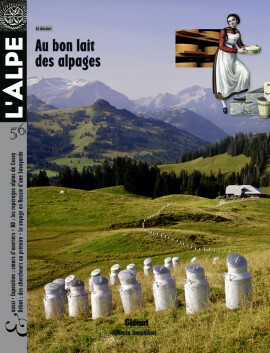 An Alpine paradise of clean air, cheese and pure milk squirting from the teats that the milk industry uses massively. The tasty mountain cheeses owe everything to the flora. Both the colourful plants of the mountain pasture and the more discreet bacteria in the milk. The transformation from the one to the other is a secret of the cows… that only raw milk can truly reveal. An excerpt of a plea for bacterial diversity. The portraits by Fabian Scheffold compose an unusual gallery. Each one introduces a chapter in a remarkable book devoted to Swiss cheeses made of raw milk. It is clear that both the photographer and his models, the men and women who make the outstanding cheeses, were having a great deal of fun ! The Swiss culinary culture reserves a large role for dairy products and the local recipes based on them. But in addition to the traditional cheeses, there is a more discreet product that reveals a particular part of Switzerland that never forgot that everything in milk is good. Excepts. There are no limits to how a mound of creamy, golden butter can be decorated. Generations of mountain folk have come up with extremely creative ideas, in the form of carefully sculpted imprints, rollers and moulds. A wonderful example of Alpine folk art. Grass, cows and milk constitute a trilogy that long presided over the destinies of mountain people, notably in the Val d’Aoste. A fascinating book on life in the high pastures of the Val d’Aoste brings the pastoral society back to life thanks to the last living participants. Milky excerpts. During his childhood, the author was often sent off to the Vercors highlands for his health. Back in the beginning of the 1960s. To this day, certain unpleasant memories remain and he still truly hates curds. Whey is good for your health. Shepherds have always known that and it was used in the 1800s in health centres in Switzerland. It was generally drunk shortly after being produced in nearby pastures, but it could also be used for baths. In France, it was Dr Nièpce, an inspector at the spa in Allevard, north of Grenoble, who pioneered the technique. Spring is around the corner and it would be fun to visit the mountain pastures with the cows in May. And what better way to organise a hike than to line up a tasty stop on the way, to discover the dairy and cheese products of the Alps. Particularly after reading this issue ! Bernard Ciancia photographs Alpine workers like the great Robert Capa, up close. The Musée Dauphinois decided to organise, in the cloister, a major exhibition of photographs on metal, that marks the starting point for a series of exhibitions devoted to photography. Do you know Jonathan ? A solitary hero whom his Swiss artist draws into an endless journey, from the Alps to the Himalaya. A series of adventures arising, in part, from travel memories transformed by the imagination of the artist. At the Médiathèque Valais-Martigny, an exhibition presents these poetic remembrances. A 20 000 euro fine for libel. 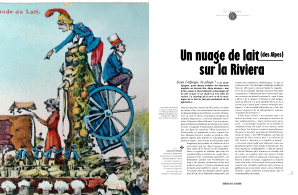 Three teacher-researchers were recently sentenced for their analysis of the Savoyard regional movement. The judgement was later reversed on appeal, but simply for technical reasons. Will scientists be able to do research and publish their results in the years to come ? An analysis by two other researchers. It was quite an adventure for Léonie Dubassat who travelled from Faverges to Vladivostok and then back, with a violinist and photographer husband who, over the subsequent decades, took the portraits of his new Alpine neighbours. A love story researched by another photographer and talent scout.